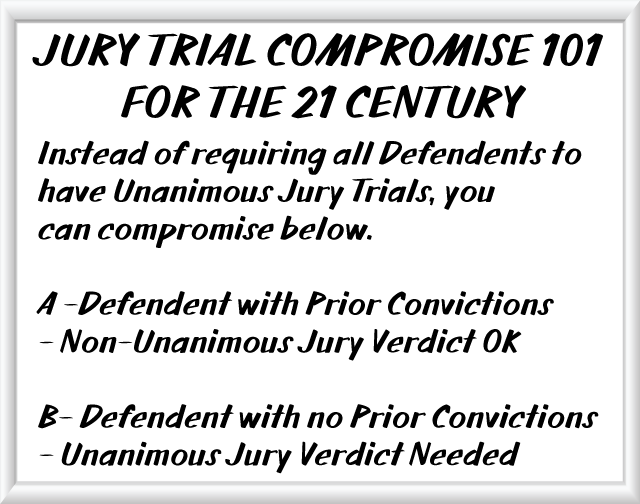 In regards to the unanimous jury trial verdicts and non-unanimous jury trial verdicts, states and the feds should propose that those defendants with prior convictions don't have to have a unanimous jury trial verdict. That is, 11 - 1 for say, one prior conviction. and 10 - 2 for two or more prior convictions. And those defendents with no convictions can get a unanimous jury trial. That's called Compromise 101 in the 21st Century.